Photo Credit: Marine Conservatory Institute, Click to enlarge. We knew this was coming. gCaptain reports implementation and gives more detail. If I read this right, the area encompassed in larger than the entire US Atlantic Coast EEZ (considering Gulf of Mexico separate) and the difficulty policing it is exacerbated by the fact that it is in several pieces separated by hundreds of miles. As I noted earlier, this sure looks like justification for at least one more cutter in Hawaii, and possibly other additional ships and air assets there or in Guam. A ninth NSC added to the FY2016 budget appears well justified. 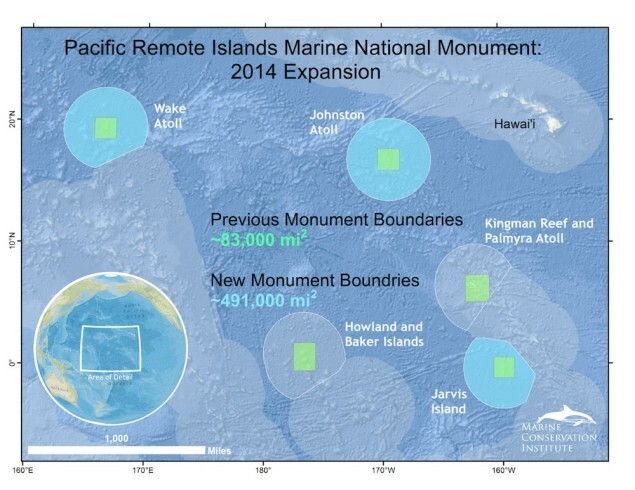 This entry was posted in aircraft, Budget, International, News, Operations and tagged Pacific Remote Islands Marine National Monument by Chuck Hill. Bookmark the permalink.